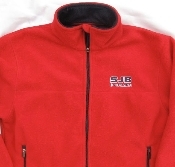 Red SJB COUGARS FLEECE JACKET with two front pockets. Zip up to create a turtle neck collar for supreme warmth on the coldest of days. Toggle closure at waist secures a close fit to help fight against chilling winds. 100% polyester. Unisex.